As a diehard Doug Aitken fan, I’m elated Station to Station is going to be here on Thursday night. The nomadic happening features yurts, Beck, African processions and bookend Aitken performance. It sounds chaotic and fun! Art = Meschac Gaba organized procession featuring participants wearing different African headdresses. Doug Aitken will create a short bookend performances to open and close the live part of each happening. Music by Beck, Dan Deacon, No Age, Sun Araw, The Congos, and others! Yurts by Kenneth Anger, Urs Fisher, Liz Glynn, Carsten Höller, and Ernesto Neto. EVENT: Station to Station, an artist-driven public art project made possible by the Levi’s® brand, is a moving platform for artistic experimentation that invites artists and audiences alike to participate in a creative collision of contemporary art, experimental music, and film. Please note that this event is SOLD OUT but there will be publicly accessible art on view. A unique performance by Beck created and composed exclusively for this event will take place, along with performances by Dan Deacon, No Age, Sun Araw, The Congos, and others. The happening will also include a procession organized by Meschac Gaba featuring participants wearing different African headdresses, and Doug Aitken will create a short performance work to open and close the live part of each of the happenings. Five Nomadic Sculptures created by Kenneth Anger, Urs Fisher, Liz Glynn, Carsten Höller,and Ernesto Neto will be installed outside the ticketed happening. The artists were asked to envision a yurt (a portable tent-like dwelling traditionally used by nomads in Central Asia). The Nomadic Sculptures range from Höller’s yurt pierced with holes that visitors can throw Frisbees through, to Glynn’s creation of the universe that will evolve at each stop. Additionally, there will be Levi’s® brand yurts, designed as an intimate gallery-like setting where local artists will be designing and crafting new products in real time. 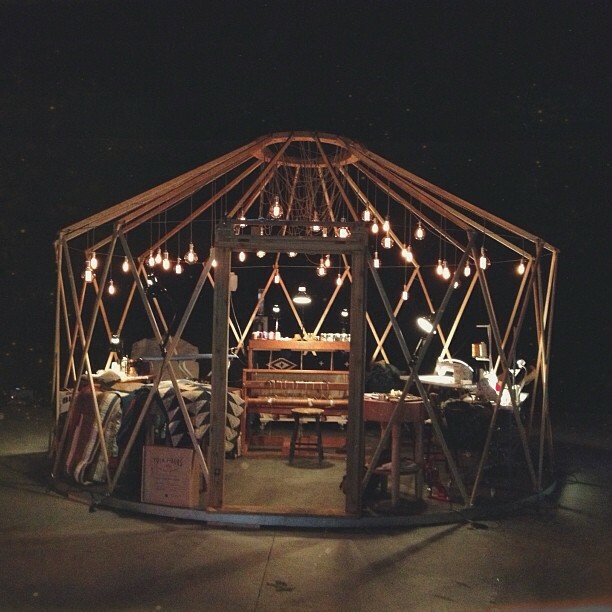 A tribute to the Levi’s® brand’s “Makers” program, the Levi’s® yurts will celebrate local artisan products. Artists featured include Folk Fibers, Cobra Boots, Chimayo, and Junkyard Jeans. ABOUT: Station to Station, the newest art project by Doug Aitken, is a nomadic “Happening” that moves by train from the Atlantic Ocean to the Pacific Coast stopping at nine different locations from major cities to off-the-grid spots, each time for a one-night-only live event in September. An artist-driven public art project made possible by the Levi’s® brand, Station to Station will raise funds through ticket sales and donations to support non-traditional programming at partner institutions around the country. A moving platform for artistic experimentation, the train’s journey will be constantly changing as artists and audiences alike encounter a creative collision of contemporary art, experimental music, and film. The Doug Aitken designed train turned kinetic sculpture will act as a cultural studio—globally broadcasting unique content and experiences from the stops as well as on the moving train. Long after departing the last station, Station to Station will leave an indelible creative mark on its local and global audience—opening eyes and shifting perceptions.